Readers of a certain age will recall “Cityscapes,” a regular Globe Magazine feature in which an archival photograph of the city ran alongside a contemporary one of the same site. Globe architecture critic Robert Campbell provided the text. Peter Vanderwarker took the new photograph. The one problem with the feature was that the old photographs were never as good. How could they be? Vanderwarker hadn’t taken them. The subtitle of “Surface Tension: Architectural Photographs From Peter Varderwarker” is somewhat misleading. The show runs through June 1 at the Boston Society of Architects’ BSA Space. A few of the 17 images are architectural photographs as commonly understood — that is, as views of a building: the Eiffel Tower, 1990; the John Hancock Tower, as it was then named officially (and remains so, unofficially), 2006. 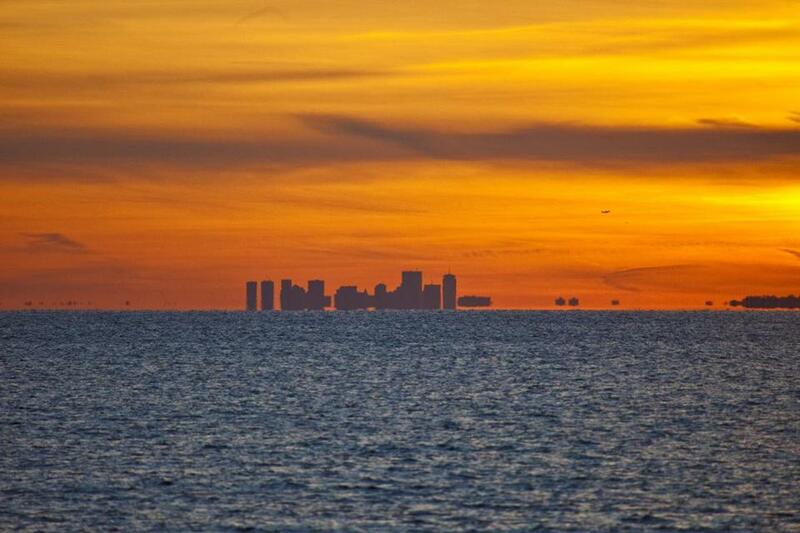 The signature image, “Boston From Eastern Point,” 2012, a truly spectacular magic-hour view of the skyline, from 25 miles away, across the harbor, equally nods to seascape, cloudscape, and architecture, so that might qualify as an architectural photograph uncommonly understood. That would be only fair, since it’s such an uncommon photograph. Other subjects — Yellowstone; Great Meadows, west of Boston; the floor of the painter Robert Motherwell’s studio — would seem to have nothing to do with architecture. Except for this: Architecture isn’t ultimately about man-made structures but the compositional arrangement of forms. In that sense, all these are most definitely architectural photographs. In an artist’s statement, Vanderwarker says, “I spend a lot of time looking at how light works to make a surface read well: concrete must have texture, steel must look robust, and glass must be clear. The way light strikes these materials is critical, and it can make or break a photograph.” With Vanderwarker’s, it’s making, not breaking. The photos are big (most are 30 inches by 40 inches, or vice versa). Their being unmatted, with white frames, makes the colors look all the more luxuriant. Contrasting colors is one of the things that Vanderwarker likes. So are contrasting textures, reflections, flirting with abstraction, having detail do the work of the whole. Focusing on a detail is a form of framing that’s conceptual as well as visual. So is avoiding any horizon line. That’s framing at its most godly, since with the horizon it’s ultimately the Creator who’s in charge — without a horizon, it’s the photographer. If Vanderwarker’s pictures are about architecture as composition in two dimensions as well as three, then the dozen photographs in Neal Rantoul’s “Boston Up” are both traditionally architectural (their subject matter is Boston skyscrapers) and spiritually architectural. The architect Louis Sullivan’s famous declaration, that the tall building “must be every inch a proud and soaring thing, rising in sheer exultation,” finds vivid expression here. It also finds unusual expression. In 1982, Rantoul used infrared film to photograph such well-known Boston buildings as the Federal Reserve, the John F. Kennedy Federal Building, 100 Federal Street, and 99 High Street. The film “gave the images an odd, surreal glow that I swiftly became invested in,” he writes in an artist’s statement. It’s hard for a viewer not to make a similar investment. These photographs entice the way haunted houses do — and these haunted houses are really, really big. (So are the images: 30 inches by 30 inches.) Rantoul adds to the unusualness by shooting from below and often on the bias. Odd glow, canted angle, and massive subject combine for a sort of religioso effect. The pictures display spookiness, grandeur, a kind of blank-faced awe. Are these buildings themselves deities or reaching up to worship deities? Expect no answer. All photographs are silent, but these are silent the way Easter Island heads are. Be warned, the show is a bit bewilderingly laid out, having been hung in two conference rooms. The doors are open, though presumably not while meetings are going on. It would serve them right, whoever’s in charge, if you just go in anyway. The show consists of 19 large-scale color images. March took them last summer on a commission from the Barr Foundation. The house in the title is Boston, and the room is the waterfront. Happily varied, the pictures take in Carson Beach, Spectacle Island, LoPresti Park, East Boston, Charlestown, Dorchester — and people in those locations. March understands that more important than either room or house are residents.